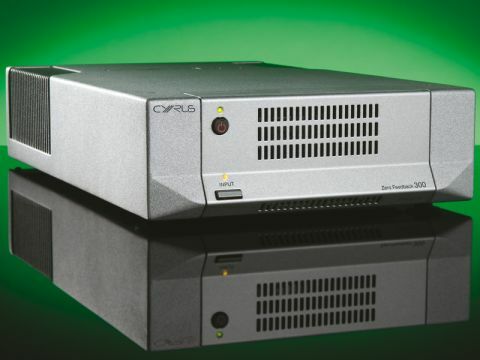 Cyrus is not a brand that we associate with high power amplifiers. It made its name with compact integrated designs that were renowned for their agility and musicality rather than muscle. But times clearly change and, while Cyrus still uses half-width magnesium casework, what it puts inside them is completely different. The Mono X 300 is a total refinement of the Mono X that preceded it. We would be impressed if anyone could fit a 300-watt class D switching amplifier into a Cyrus case, let alone one with a linear power supply. So what gives? This amp is not merely about power either, the avoidance of global feedback in the circuitry marks it out as a rarity in the transistor amp universe. Others utilise this mode of operation (Ayre and Vitus Audio among them) and if you were to check the prices charged by these brands it will be apparent that the Mono X 300 looks like good value. The zero-feedback circuit allows the front and rear stages of the amplifier to work independently, so the corrections required in the high-powered output stage do not influence what's going on at the input stage. Cyrus cites the main benefit to be very low noise, especially through the midband where we are naturally most sensitive to distortion. This is not the first zero-feedback power amp from the company. The first one appeared seven years ago and has been modified and upgraded in production. For the Mono X 300 and the more affordable X 200, Cyrus has completely redone the circuit board layout and earthing, while replacing the transformers with examples that run more efficiently at standby. Confusingly, the X 300 is not strictly a 300-watt amplifier, but rather achieves that output into loads between eight and four ohms, which tallies with the dynamic impedance of most loudspeakers. As well as the usual on/off switch there is an input button to toggle between RCA and XLR inputs, you can also power up using the Cyrus MC BUS system or a 'music sense' mode that does what it says on the tin. The amp has two small fans that operate if it's pushed hard for an extended period, but they were not audible while we were giving the amps a good thrashing. The build quality is consistent with that seen across the Cyrus range, a line-up which starts out at just over £500 for the 6 Power, the least expensive power amp. This means that it lacks the bling of other amps at the price, but its worth considering that you pay a high price for the casework on most high-end products. By amortising the cost of its die-cast magnesium casework across so many products, Cyrus is able to offer considerably better value than most in this sector. There aren't many high-powered monoblocks available at this price, but there are quite a few more powerful stereo amps to beat, not least Bryston's 4B SST2 (£4,500) and the slightly dearer Krell S275 (£5,795). Of course, power is no indication of quality and Naim's NAP 300 (£6,100) would probably give the Cyrus a musical run for its money. The Mono X 300 does not sound like a high-power amplifier – it doesn't have the grip and muscularity of a Bryston or a Krell, what it has instead is quite an astonishing degree of transparency. We heard things on discs that have been reference points for years that have not been apparent before, it's quite uncanny really that this can be achieved with 'just' a power amp. The new Townshend Glastonbury Pre preamp we had on loan had more than a little to do with this, but it was in use with our reference power amp before the X 300s turned up. In some respects these amps can sound soft, but this is because they deliver all the harmonics of the instrument or voice along with the fundamentals. All this finesse would not be so engaging if the timing did not hit the mark, but put on a punctual track like Fit Song by Cornelius and you know that speed is not an issue. Muscular amps are never able to deliver the degree of nimbleness on offer here and do not have the ability to make the music come alive. Thug Angels by Wyclef Jean is a bombastic track that needs both power and speed and these amps jump both those hurdles. In all honesty, we thought that Cyrus had gone too far by making a power amp at this price, but we have been pleasantly surprised at how well the job has been done. The Mono X 300 maintains the company's characteristic musicality and adds a degree of definition that is higher than most we have heard. This is an extraordinary amplifier in a case that we have come to think of as ordinary, but which clearly does not hamper results. It will give you both the minutiae and the thrill of the music and puts Cyrus into the top league in no uncertain terms.